For those of you knowing their way through the line-up of the Volkswagen Golf VI family are familiar with the two top models; the front-wheel drive 207hp GTI and the R. The new, sixth-generation Golf is one of the better compact cars, combining great-handling and a comfortable ride. Within the line-up the all-wheel-drive Golf R is the fastest, most powerful, and most expensive Golf ever. 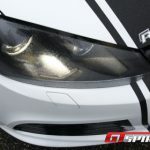 Swiss tuner Sportec took the potent hatchback into their workshop and created an unique package available for us to be driven in a road test. Like any of the Volkswagen R models, this model has been developed by Volkswagen Individual, the special projects wing of VW. 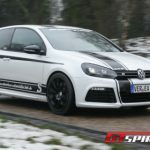 The main difference with the previous R32 models is that the R is not powered by a naturally-aspirated 3.2 liter V6 engine but by a 2.0 liter TSI engine derived from the previous GTI rather than the latest version. 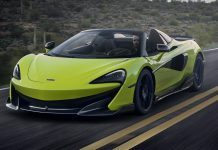 As standard the engine features an uprated turbo, a new intercooler, high pressure injectors, a new alloy head, and uprated pistons and conrods to take power up to 270hp at 6,000rpm and 350Nm at 2,500rpm. All in comparison to the FWD GTI. 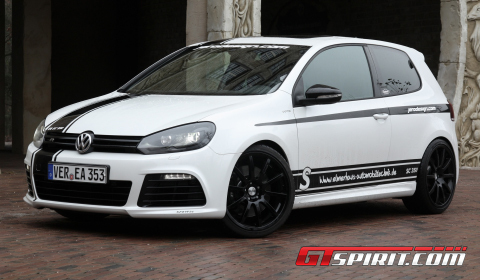 For most of us that would be enough in a Volkswagen Golf, but knowing Sportec as a tuner capable of achieving high standards – best example is the Sportec SPR 1 R -, the powerful hatchback received a higher output, some new decals, a three-stage valve controlled exhaust system, a different intake and a Bilstein lowering kit. The setup was at our disposal for a single day, giving us the opportunity to test the most powerful Golf available on the market today. The stock performance of the German hatchback is provided by a 2.0 liter turbocharged intercooled DOHC 16-valve inline-4 engine with a maximum boost cranked up to 17psi. Sportec included a performance optimized and reprogrammed ECU, sport catalytic converter, Sportec turbocharger IHI.270 and a sports air filter. The figures tell the complete story. The final outcome is 352hp at 6,100rpm and 480Nm of maximum torque which is available starting at 2,500rpm up to 5,000rpm. The top speed increased with 25km/h to 275 and a sprint from zero to 100km/h is done in about five seconds, 0.5 faster than the stock R.
The Golf R is supremely competent by itself, but the increase in power by Sportec brings the SC 350 closer to the brand new BMW 1-Series M Coupe and the Audi RS3. Even though both are still operating in a higher league as the five-seater from Wolfsburg. The Golf R is a very quick car, but if you are acquainted with real sports cars, you won’t be overwhelmed. 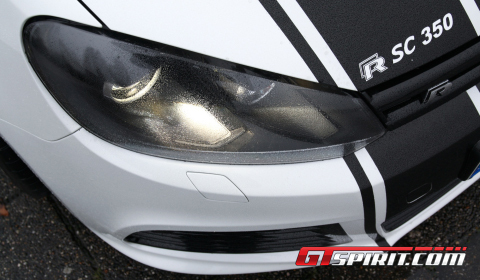 The Sportec package brings it much closer to that true sport cars feeling than the standard car. And that is quite an achievement! Additionally, the technical side of the story also includes two additional parts; a valve-controlled Sportec exhaust system with three settings controlled via a single button in the dashboard and a Haldex performance system named HPP Gen 4, which changes the power distribution with respect to the all-wheel drive system. The special Sportec designed middle-replacement tube and end mufflers are the non-visible part of the exhaust system. Two 90mm diameter tips with Sportec logo are shown at the back of the vehicle. The sound production is controlled via a three stage system offering a moderate, sport and racey sound track. The difference between the normal and sport mode is hardly noticeable from the outside, but does give a nice growl on the inside. The race setting is a different story. The exterior sound increases drastically giving the vehicle a deeper growl with some decent backfire while the inside is filled with an even higher exhaust note. In the end we choose the race setting during our complete drive. The Haldex performance system – in this case Gen 4 – is used to monitor throttle input, ABS wheel speed sensors steering angle and to anticipate and distribute torque transfer from the engine to the driveline. The system reacts to these dynamic changes creating more favourable or aggressive handling characteristics. The main purpose of the system is improved chassis and stability control using three modes; Stock, Race and Eco. 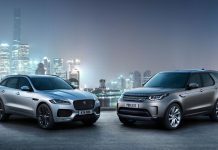 The Race mode will unleash a better potential as it provides faster reaction time to vehicle inputs in the AWD communication system, and allows larger amounts of torque transfer to the rear axle. Eco mode was developed for increased fuel efficiency. Its purpose is to reduce the torque transfer from front to rear during normal highway driving (coasting), but will immediately engage the system if a wheel starts to slip to prevent decreased traction situations. The main issue with the system was the fact that you only experience its immediate influence in true track day conditions. Our road test did not include a lap around a track so we only felt some minor differences with respect to the different settings of the system. For those in favor of such a system, only choose it when you are planning to do some decent cornering or laps. The suspension setup also included a Bilstein PS09 kit with adjusted stabi bar setting lowering the vehicle up to 40mm. The kit makes the ride harder, but not unpleasantly. The Sportec Golf R SC 350 isn’t a pure sports machine, but a great and powerful vehicle to drive. To round off the complete package Sportec added some decals and striping to the unique individual pearl white paint. The wheel set consists of Sportec mono 10 rims in individual metallic black color trim with tires sizing 235/35/R19. The stylish pearl white paint and metallic black rims were a superb looking mix. To conclude this story we can say that the Golf R was never build as the fastest car on the planet, but to strive for a balance of overall performance, value and high quality. Sportec just added a bit more potential to it increasing its performance and setup to a level it’s reaching the sub-five second region. 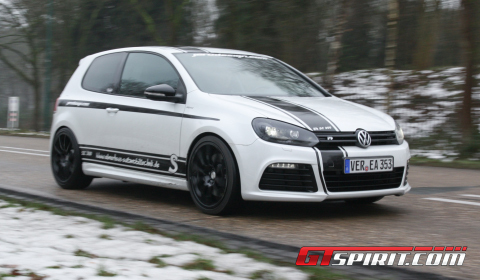 The ride is fast but comfortable, the exhaust sounds wonderful in race mode and the increased power potential proves to be a decent addition to the setup of the fastest Golf ever produced. Overall, we can say that the Swiss have nailed it! Special thanks to Jero Design, Sportec Benelux Dealership!